This review describes the morbidity of inguinal lymph node dissection (ILND) performed as part of the management of penile cancer as well as recent modifications that may reduce the incidence of complications. A review of the literature was conducted using Pubmed© for studies reporting complication outcomes of ILND for penile cancer. Furthermore, our contemporary results and patient related morbidity associated with ILND performed for penile cancer are reported and compared with prior series. 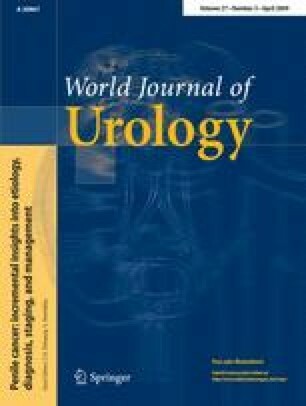 A review of the literature over the past 25 years identified 27 manuscripts discussing complications of ILND in the context of penile cancer. ILND has traditionally been associated with an 80–100% risk of surgical morbidity, with skin necrosis, wound dehiscence, infection, and lymphedema the predominant findings. Recent technical modifications and management strategies have reduced the associated risks of this surgical procedure. Most recently, we report a 19 and 27% rate of minor and major complications, respectively, for a diagnostic ILND (i.e., superficial ILND alone in the absence of nodal metastasis) and a 29 and 24% rate of minor and major complications, respectively, for a therapeutic ILND (superficial/deep ILND and pelvic lymph node dissection in the presence of nodal metastasis). In contrast, among clinically node negative patients undergoing dynamic sentinel lymph node biopsy as a staging procedure, the reported complication rate was 7%. The incorporation of novel management strategies and surgical modifications have resulted in decreasing peri-operative morbidity associated with inguinal staging and therapy.